Polytrifluoroethylene (PTFE) is sometimes considered one of the “miracle” plastics created in the 20th century. Originally created by accident in the labs of DuPont™ it took 16 years until the material was first used (by French engineer Marc Grégoire) in the application where the material is most widely encountered – non-stick cookware. From that point PTFE’s strong reputation was born. Its usefulness in everyday kitchens has convinced the general population of the benefits of PTFE. In engineering, PTFE and its “sister” fluoropolymers serve as a “bridge plastic” between engineering plastics and the higher performing (and more expensive) imidized plastics. PTFE has some advantages over many other plastics but also some deficiencies that need to be taken into account. We share these not to discount the material – but to provide you with the best possible information to assist in your material choice. –Slick: An extremely low coefficient of friction. Not just the lowest of all plastics, but one of the slickest solid materials known. 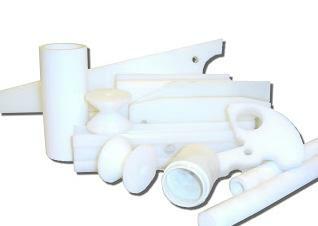 –Operating temperature: PTFE handles up to 500 degrees Fahrenheit operating temperature which is above most plastics. –Moisture absorption: Essentially nil, sharing this property with Acetal and UHMW. –Impact strength: Materials like UHMW, Nylon, Phenolic and urethanes would be a better choice. –Load strength: Only can handle around 500psi. In many applications where this is important Phenolic, Nylon and Urethanes are a better choice. –Hardness: PTFE is a soft plastic and this property factors into the properties above. We hope that has shed some light on PTFE. For more information on Redco™ PTFE click here or contact us today.